ECHO - The Echo Cougars hosted WWVA in an evening game on Saturday, December 6, 2008. The Cougars won 41-31 after being down a point 15-16 at halftime. Echo increased their scoring opportunities while increasing their defense against WWVA early in the third quarter. The Cougars held WWVA to 18 points for about four minutes allowing Echo to score 11 points and take a commanding lead of 30-19 at the end of the quarter. Echo controlled the fourth quarter even though WWVA scored 12 points to Echo's 11 points. Echo took the win 41-31. Echo had eight players score. Elizabeth Ferge had 17, Kristin McCallum 8, Ryanne Tarvin 5, Ashley Gregerson 5, Shilah Hillard 3, Lauren Elligsen 2, and Taylor Tarvin 1. 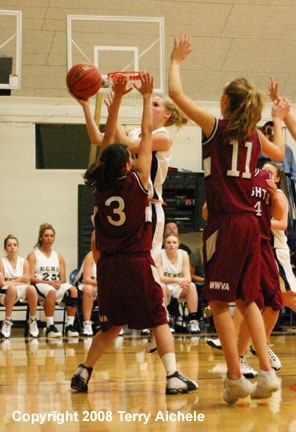 Walla Walla had six players score. Victoria Buell lead with 17,, Elizabeth Field 4, Karli Will 4, Amanda Leon 3, Katie Brewer 2, and Angela Birdsell 1. 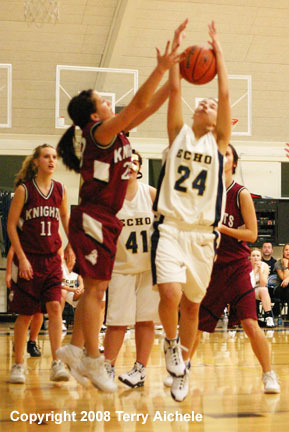 LEFT - Lauren Elligsen, number 24, of Echo battles a Walla Walla player for a rebound. 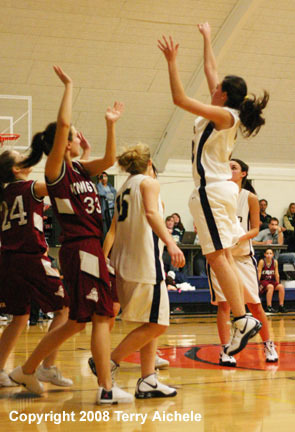 RIGHT - Kristin McCallum of Echo eyes the basket as she gets ready to take a shot. 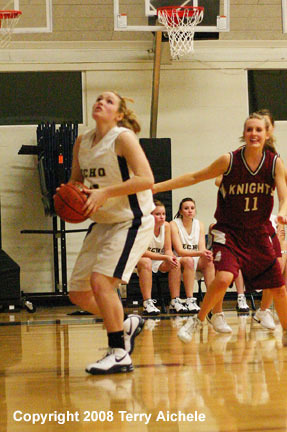 LEFT - Elizabeth Ferge of Echo drives through Walla Walla defenders to the basket. 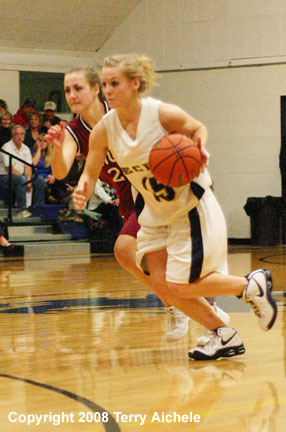 RIGHT - Kristin McCallum of Echo prepares to take a shot. 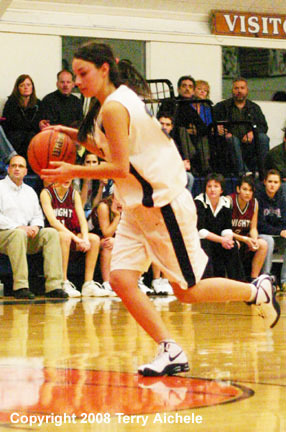 LEFT - Echo guard Elizabeth Ferge brings the ball up the court. RIGHT - Ryanne Tarvin of Echo takes a shot. 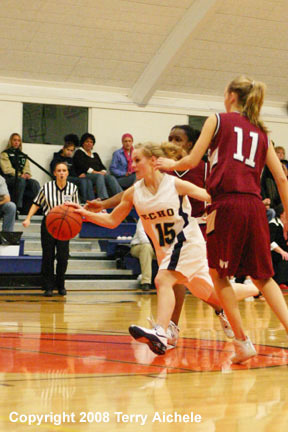 LEFT - Kristin McCallum of Echo moves to the basket. 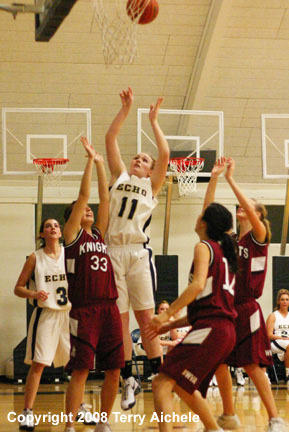 RIGHT - Echo's Kristin McCallum takes a shot. 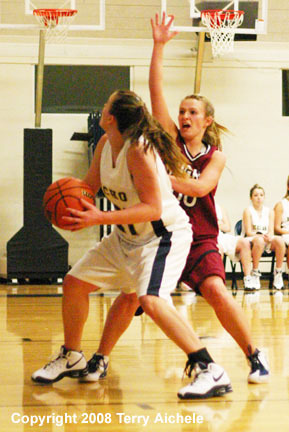 LEFT - Ryanne Tarvin of Echo with the ball. 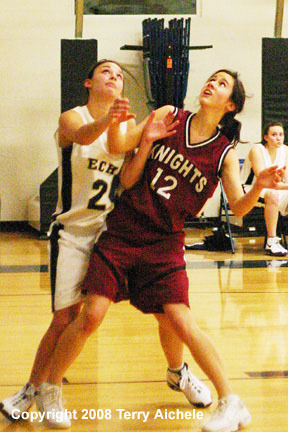 RIGHT - Elizabeth Ferge of Echo zigzags her way through Walla Walla defenders. 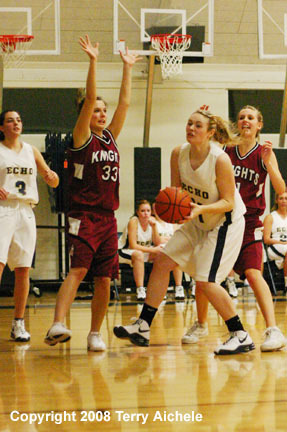 Elizabeth Field of Walla Walla is closely guarded by an Echo player.